At the conclusion of The Mentalist Season 7 Episode 11, it was fairly obvious that Gabriel wasn't the real serial killer. He probably wasn't really psychic either. If he were, perhaps his visions would have shown him the psychopath was planning to kill him next. Now it's up the FBI to catch the real killer and what better plan than to use Patrick Jane as bait. If the killer hates fake psychics, Jane certainly has plenty of experience playing one. But as with all of Jane's plans, it looks as though this one may be a work in progress. We certainly hope it all works out. We hear that Jane may have a wedding to get to in part two. 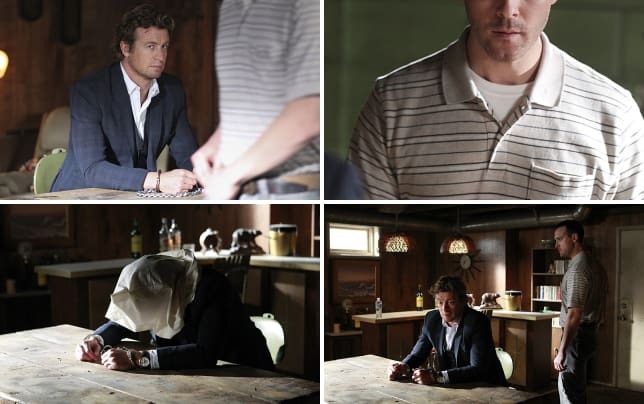 Check out these photos from part one of the two-part finale, The Mentalist Season 7 Episode 12, "Brown Shag Carpet" scheduled to air Wednesday, February 18 on CBS. The Mentalist Photos "Brown Shag Carpet"
You won't want to miss a minute of this final season. Watch The Mentalist online now at TV Fanatic. Are you going to take off your wedding ring? It just, it seems like you don't want to let go of it. Teresa Lisbon: I need to know that you're not going to run away again. Teresa Lisbon: I need to know that you're committed to this. To us. Patrick Jane: I am, that's why I want to do this. Permalink: I am, that's why I want to do this.